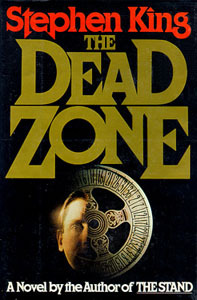 You can search for first and limited editions of The Dead Zone on Abebooks.com, eBay.com, Biblio.com and Amazon.com. These links will take you directly to search results for 1st and limited edition copies copies for sale on the respective sites. The Dead Zone by Stephen King - First edition points of issue. Bound: Quarter bound in black cloth with black boards and white paste downs. Dedication: This is for Owen I love you, old Bear. Limited or Special Editions: Easton Press released a limited edition of 1,300 copies in 1993 as part of the "Masterpieces of Science Fiction" series. It was reissued by Easton Press in 2004 available direct from the publisher until of 2006 and is now sold out. Easton Press maintains the right to reprint "The Dead Zone" so there is a good chance that the book will be published again. The first edition Easton Press is slightly different from the second edition Easton Press. The primary differences are on the spine of the books, internally the books are identical. The first edition Easton Press of The Dead Zone the title and author sections on the spine are found inside a gilt square, on the second edition the title and author is listed between two gilt lines. The first edition font and graphics are larger when compared to the second edition. Description: Stephen King's seventh published novel. John Smith awakens from an interminable coma with an accursed power-the power to see the future and the terrible fate awaiting mankind in...the dead zone.